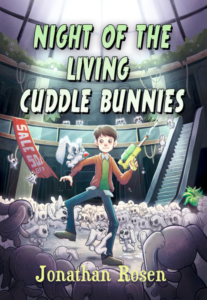 This is the website of Jonathan Rosen, the author of Night of the Living Cuddle Bunnies and From Sunset Till Sunrise, a series of scary/funny books from SkyPony Press. Please come on in, and take a look around and send him a message. Unless, of course, you’re a Cuddle Bunny, in which case you’ll never catch him alive.